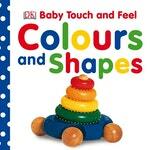 Help your little one learn colours and shapes with this delightful, touch and feel book for babies and toddlers. Explore the touchy feely pages together. Feel a silky blue butterfly, velvet red shoes, a bumpy orange, a smooth, diamond-shaped kite, and more. Look at the bright, sparkly images - from shiny green peas and a twinkly purple flower to a picture in a sparkly square frame. Help your baby to name each colour and learn the different shapes. With large word labels and one main picture per page to focus on, this baby book has a simple design that's easy for very young children to follow, helping them identify the objects, and name the shapes and colours. And every page has texture or an eye-catching shiny area to expand a baby's senses, and encourage early learning. Little ones will love turning the sturdy board pages themselves, pointing to the pictures, and feeling the tactile patches. Part of a best-selling, touch and feel series, this is a perfect first book for babies and toddlers. Love Baby Touch and Feel: Colours and Shapes? Subscribe to Read More to find out about similar books.